From the Help menu in Microsoft Visual C# Express edition select the ‘How do I’ option. Choose ‘Your First Game: Microsoft XNA Game Studio Express in 2D’ and complete the tutorial. This tutorial will guide you through creating a sprite bouncing around the screen. Since we’re making a pool game, it might be an idea to use the WhiteBall sprite I have provided (whiteball.bmp). Later on we’ll switch this to an image with a proper alpha channel (this will fix the problem of our ball being drawn with a square background). 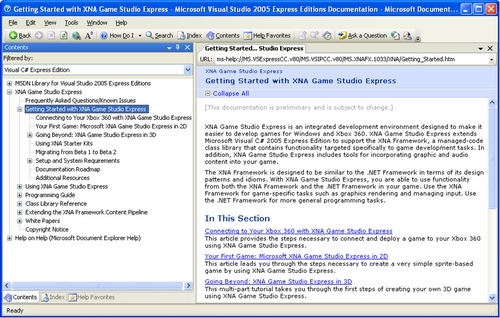 While you’re completing the tutorial, ensure you click on any interesting links that you see in the documentation as this will give you a much better understanding of XNA. Remember this tutorial is about expanding your knowledge.